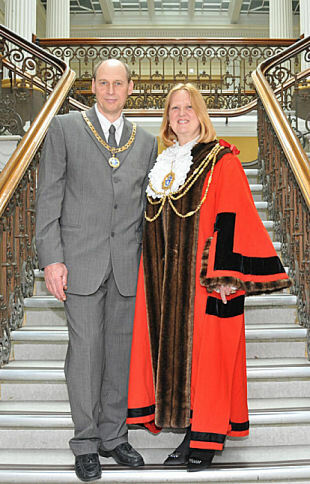 Councillor Anne Meadows was born and brought up in Bevendean, Brighton, where she attended local schools. She, and her husband Tony, who is an antique furniture restorer, have two children, and will be celebrating 30 years of marriage in 2011. They were married at the Holy Nativity Church in Brighton and their children were both christened at the same church. Anne gave up work in 1994 to canvass for local government election, and was elected Councillor for Moulsecoomb & Bevendean Ward that year. She is very active in the community and takes great pride in her work as Councillor. Councillor Meadows was a past Chairperson of the Adult Social Care & Health Committee for four years and in 2007 was elected Chairperson of the Adult Social Care & Housing Scrutiny Committee. That particular Committee produced the first ever scrutiny report on “Studentification” – which was quite pioneering at that time. One of Anne’s main aims during her mayoral term of office is to bring deprived communities closer together, and closer to the City Council.